I love using my crockpot. When it’s a “stay indoors snowy kind of day”, well that’s the kind of recipe I’m looking for. 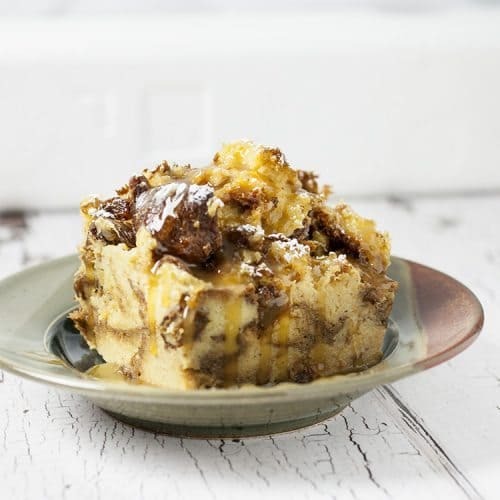 And this Crockpot Panettone Bread Pudding is a classic. I remember my Mom using crusts and bread scraps to make hers. It was so delicious, and she added some lovely spices like cinnamon and nutmeg. The recipe I found uses cinnamon bread and there are a gazillion crockpot recipes out there. Seriously, probably two gazillion. And there it was, a bread pudding recipe for my Crockpot. I must admit sounds lovely. Can’t you just smell the aroma of cinnamon bread baking into a delicious and creamy bread pudding? But you know me, don’t ya? I love to mix it up. So for this Bread Pudding I decided to use Panettone. That deliciously sweet Italian Bread you see in stores only at Christmas time. Add some lovely heavy cream, a few raisins, eggs and PRESTO! 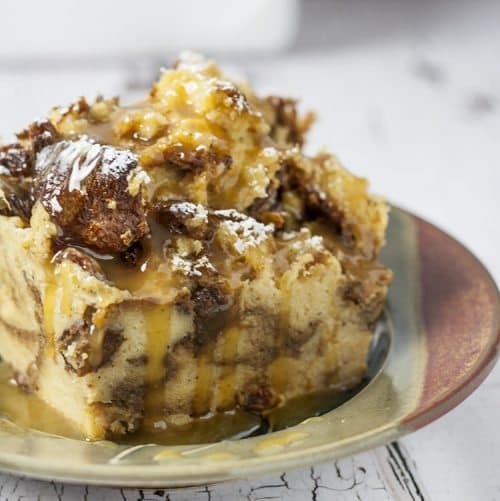 Crockpot Panettone Bread Pudding. Oh and Brandy….don’t forget the Brandy! You can typically bake a bread pudding in about 45 to 50 minutes in your oven. The Crockpot takes longer, but that you leaves you time to do other lovely things, like read a book, go for a walk or watch a movie. Yeah, that’s for me. A great movie, with some hot cocoa and my favorite blanket, all curled up. 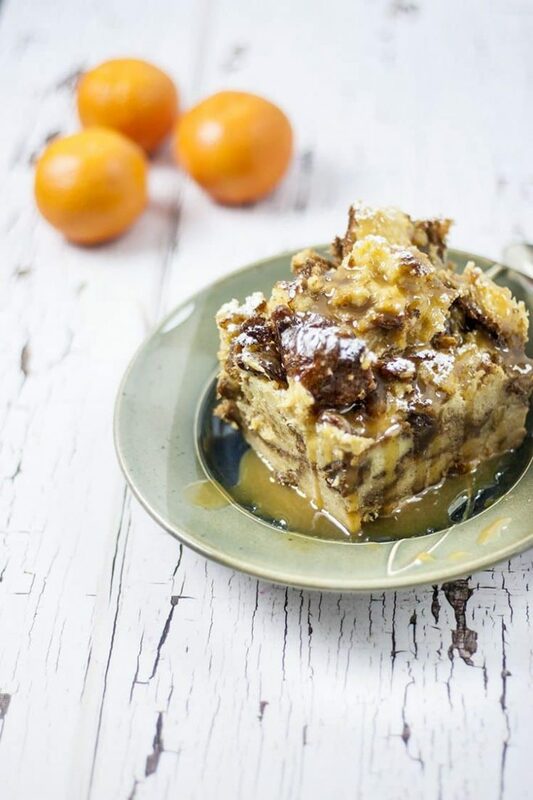 You can make this amazing Panettone Bread Pudding in your crockpot in about 2-3 hours of cooking time. I’ve also included the prep time in the recipe below so that you can plan ahead! 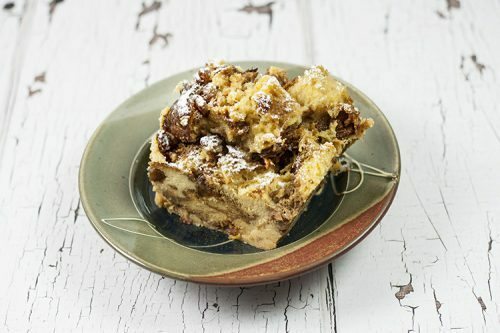 I think this delicious Crockpot Panettone Bread Pudding is a great breakfast casserole and would make a yummy dish for Breakfast or Brunch! For more Brunch ideas, Salted Caramel Coffee Cake or Apple Pie Coffee Cake will both be a hit at your next Brunch. White Chocolate and Blueberry Bread Pudding is another great recipe to try. And to top it off the Panettone Bread Pudding, I like to smother it in my yummy homemade Salted Caramel Sauce. Serve warm with delicious Salted Caramel Sauce! I rated it 5, just from the description. When your instructions say to, “beat together eggs and milk”, is that both the heavy cream and milk?? ?